In Edo period (1603-1867) in Japan, a new urban bourgeoisie emerged, mainly consisting of merchants and artisans. Despite being of a low rank on the social scale, many of them were very wealthy and could afford to enjoy themselves in the pleasure quarter of the city, where kabuki theatres, tea houses and brothels were a common feature. Among the artist of the time was a widespread interest in depicting different aspects of this life and the term ukiyo-e, meaning pictures of the floating world, is applied to the school of paintings, book illustrations and woodblock prints that do so. 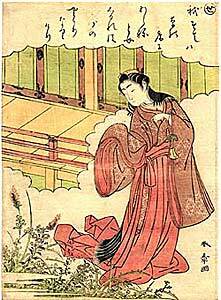 The woodblock prints were the most prominent of these. The objective of this essay is to give a brief account of the woodblock prints made in this period and explain how they were made. Not all of the different subjects and categories within ukiyo-e will be covered due to the limited space of this essay. Neither will specific artists be covered in depth; rather will a couple of them be mentioned at a certain stage of the development of ukiyo-e where they contributed significantly. The ukiyo-e prints of the last decades of the Edo period, which ended in 1868, when imperial power was restored and under the Meiji emperor, are not considered to be of the same high quality as earlier works. Society underwent significant changes as the Tokugawa government’s closed door policy came to an end and a part of the explanation of the decline could be increasing competition from modern technologies, such as photographs and newspaper illustration, that were introduced to the country. 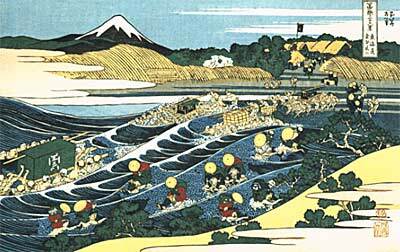 (18) Thus, it seems that the ukiyo-e prints disappeared in part because the society changed, and thereby the market for them, and in part because new techniques could replace many of their social functions. 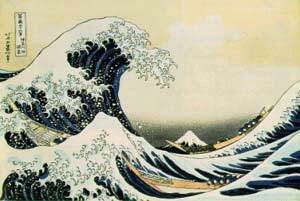 However, woodblock prints still fascinate and are today being collected around the globe. After the carving process was finished, the colour blocks and the key block were handed over to the printer who had prepared the sheets of printing paper by moistening them. The paper was made from the bark of the mulberry tree. The printing process would be carried out in the same order as the carving. Thus, it would be as follows: first, the key block was be placed on the printing stand and painted with black ink. Then, a sheet of printing paper was placed on upon the block in alignment with the guide marks. Finally, the printer used the baren to rub the paper, creating an impression of the block. After followed the same procedure for the colour blocks, resulting in the finished print. First printing the key block, followed by the colour blocks, made it possible to adjust each colour block to fit the colour between the outlines. The pigments were mostly of a transparent type, so there was no problem with opaque pigment covering the lines. (23) The size of the editions varied, but around 200-300 was usual. At larger amounts problems would arise because of the printing blocks absorbing water and thereby expanding. A fine edition of that size would have taken about two weeks to complete. However, use of fewer colours and less care could reduce the time required significantly. Hillier, J.: Japanese Colour Prints. Phaidon Press Limited, 5 Cromwell Place, London, 1966. Lane, Richard: Images from the Floating World. Konecky & Konecky, New York, 1978. Love Liman is a student of Thai Boxing who attends the University of Edinburgh, Scotland. When she was researching the Internet on Woodblock prints for a research project, she came across a FightingArts.com article on the subject by Christopher Caile and contacted the site. We requested she submit the final paper which appears above.